"Chitty Chitty Bang Bang" from 1964 is Ian Fleming's only work of fiction not to feature James Bond 007. 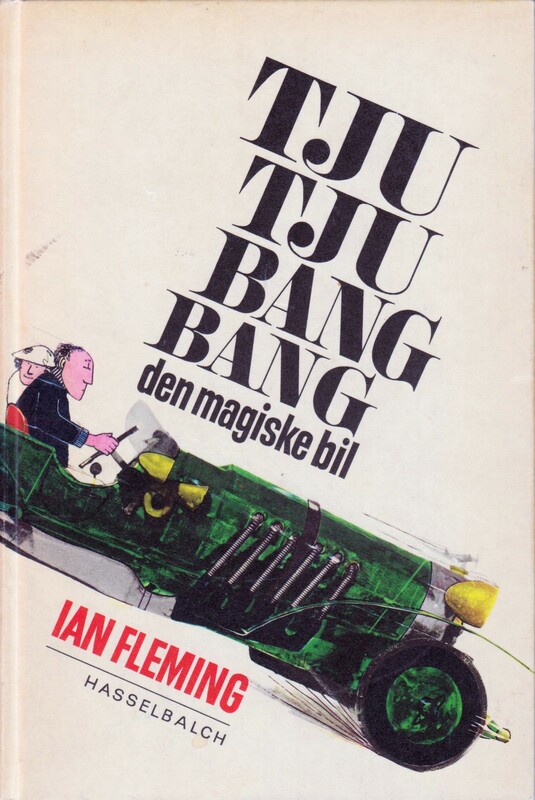 Of the three books written by Fleming outside of the James Bond 007 series, it is the only one to be published in Danish. Ian Fleming originally came up with the tale of the magical driving, sailing and flying car as a bedtime story for his son, Caspar Fleming. While recovering from a serious heart attack in 1961, Fleming was encouraged by his friend, Duff Dunbar, to write up the story for later publication. On October 22, 1964 – two months after Ian Fleming's death – Jonathan Cape published the first of three hardcover volumes that constitute the British first edition of "Chitty Chitty Bang Bang". 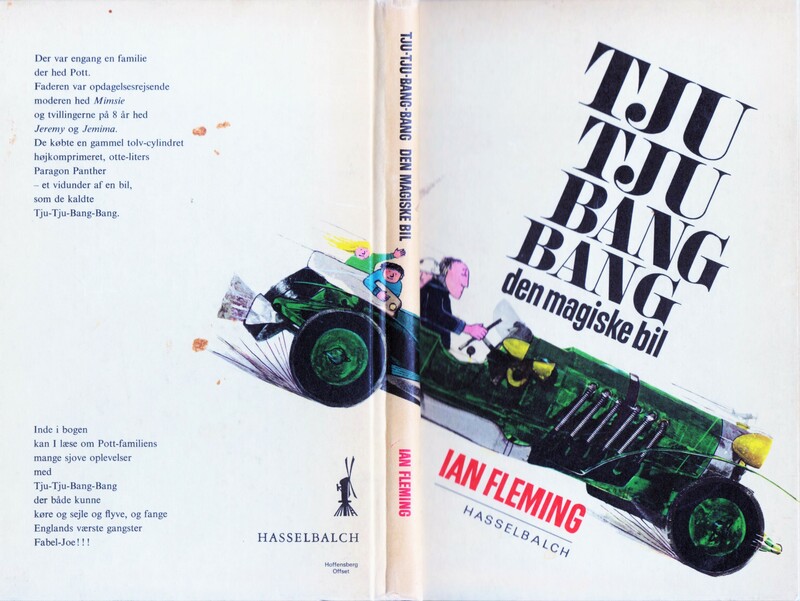 The Danish edition published by Hasselbalch, titled "Tju-tju-bang-bang", combines all three volumes into one hardcover edition while retaining John Burningham's original illustrations. The book has never been reprinted in Denmark, and none of the three official sequels written by Frank Cottrell Boyce from 2011 to 2013 have been translated into Danish. ● Official site for Ian Fleming's "Chitty Chitty Bang Bang"
"Chitty Chitty Bang Bang" was adapted into a big-budget motion picture by James Bond 007 producer Albert R. Broccoli in 1968. The film was released into Danish cinemas on 8 December 1969 under the original title of "Chitty Chitty Bang Bang". Ian Fleming's story was adapted into a screenplay by the film's director, Ken Hughes, together with two James Bond scriptwriters, Richard Maibaum and Roald Dahl. Among the cast, Gert Fröbe (Auric Goldfinger) and Desmond Llewelyn were well-known from EON Productions' James Bond 007 series. Behind the scenes, a number of James Bond veterans contributed to "Chitty Chitty Bang Bang" including production designer Ken Adam, assistant art director Peter Lamont, production associate Peter Hunt, and special effects supervisor John Stears. The title song, "Chitty-Chitty-Bang-Bang", composed by Richard M. Sherman and Robert B. Sherman, was nominated for an Academy Award (Oscar) in 1969. In 1969, Danish singer Grethe Mogensen recorded the title song as well as "Truly Scrumptious" (retitled "Første klasses", meaning "First class") with Danish lyrics by Thøger Olesen. Both tracks were issued by EMI as a 7" single with Mogensen accompanied by two children, Lena and Jonna, and Sven-Olof Walldoff's orchestra. The Sherman Brothers' musical song score reappered in the stage musical "Chitty Chitty Bang Bang", which premiered in London in 2002 and is touring Great Britain as of this writing. Further productions of the stage musical include Broadway, New York, USA (2005), Singapore (2007), Australia (2012) and Munich, Germany (2014). ● Official site for the stage musical "Chitty Chitty Bang Bang"